The woman in this picture was dealt a rotten hand. She was my mother. The fellow in this picture is my father. They had this photo taken to commemorate their engagement. 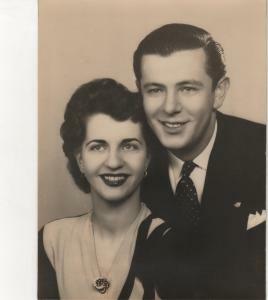 They were married on Aug. 24, 1946 and stayed married for 34 years. Then Dad died in a boating accident; he was 59 years of age. However, this post is about Mom. She would live only a little more than four years after Dad. On Wednesday, she would have celebrated her 95th birthday. She lived for just 61 years. My sisters and I occasionally wonder how Mom would have grown old. I have my theory, which I’ve shared already on this blog but I want to restate it here as my way of wishing her a happy birthday. The hand she was dealt? Well, she died of complications from Alzheimer’s disease. Yes, she was young when she passed away. One usually doesn’t waste away in the manner Mom did at the age of 61. But she did. In fact, her condition began to change years before. Looking back on the nearly 34 years since her death, I have a bit of trouble recalling precisely when we began noticing changes in her behavior. Maybe it was five, seven — or perhaps 10 years. At the end, she couldn’t speak. She couldn’t do a single thing for herself. Alzheimer’s disease ravaged her. I occasionally ask myself: What would have happened had Mom not been dealt the hand she received? How might she have grown old? A clue remains imprinted on my mind. Long before she began her slide into the Alzheimer’s never-land, Mom would reveal what kind of young woman she used to be. She was proud of her social skills. She once proclaimed to me that she often was the life of any social gathering she would attend. Mom was full — if you’ll pardon the pithy expression — of piss and vinegar. She was unable to rediscover the mysteries of her younger years. Disease made sure of that. Had she been able to grow old free of the disease that killed her — particularly without Dad’s presence in her life — I remain quite convinced that she would have rediscovered much of what made her the life of the party. None of that happened. I am left these days merely to wonder. Fate can be cruel. It was to my dear mother. She would have turned 95. I want to wish her a happy birthday. Wherever she is, I am certain she’ll hear it. I hope she is smiling. Previous PostYes, presidents can be investigated and indictedNext PostStrange legal bedfellows?